In recent days, Turkey achieved the most notable military victory since the Greco-Turkish War of 1919-1922. On March 18, the Turkish Armed Forces (TAF) and the Turkish-backed Free Syrian Army (FSA) captured the city of Afrin from the Kurdish People’s Protection Units (YPG) following an almost two-month long military operation in northwestern Syria. The advance, entitled Operation Olive Branch, was widely covered in the Turkish media in a heroic style creating a patriotic frenzy in the country. During the whole of 2017, the media and authorities were conducting a large-scale propaganda campaign supporting the military and encouraging citizens to enlist. Some foreigners visiting Turkey in the period mentioned leaflets in municipal transport vehicles promoting the ideal of becoming a martyr defending the interests of the country and nation. Turkish policy is infamous for its flexibility, a rapid and often hard-to-predict ability to change priorities and allies. According to some reports, the Turkish military victory in Afrin had become possible thanks to a political agreement between the Turkish leadership and the administration of US President Donald Trump. In recent months, there was always at least one Turkish deputy foreign minister in the US for negotiations and at one point most of them were there together. Meanwhile, Ankara was involved in a successful political dialogue with Moscow, thus preventing Russian interference with its plans or support for Syrian Kurds. Nonetheless, the US-Turkish backroom deal was the main factor behind the success in Afrin. The US halted its military support to Kurdish militias in northwestern Syria and pressured the Kurdish leadership in the rest of so-called Rojava thus preventing a minor chance that the YPG, known in the mainstream media as the SDF, would open up a new front against the Turkish forces. As a result, the YPG abandoned its key stronghold of Afrin almost without firing a single shot. The number and types of weapons and ammunition captured by the TAF and the FSA in the city proves that the YPG in Afrin had been receiving military supplies from both the so-called US-led and Russian-led blocks. 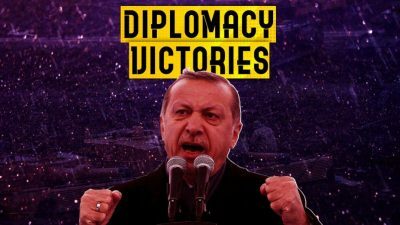 While details of the game behind the scenes are yet to be revealed, the recent developments have, in any case, led to the Turkish military and diplomatic success. Almost immediately, following the fall of Afrin, Turkey started implementing a more pro-US approach in its foreign policy. It wiped the YPG out of northwestern Syria and thus no longer needs to manoeuvre between the US and Russia over this issue. At the same time, Ankara’s expansionist aspirations are still on the table. The Erdogan regime will try to annex the north and northwest of Syria by establishing a quasi-state or an autonomy controlled by its proxies. The Syrian government, Iran and Russia will not be able to tolerate this. In this way, the US could become an organic ally of Turkey in northern Syria in the near future. However, the depth of the possible US-Turkish cooperation will depend on multiple factors, one of them is the Manbij issue. The city is currently controlled by the SDF, which is a mostly PR brand for YPG units backed up by the US. Ankara seeks to kick the YPG out of the city and its countryside by a military force. However, US troops deployed in Manbij and patrolling the Syrian-Turkish border in the SDF-held areas prevent this. In this situation, Turkey has proposed the US to establish a joint security zone in the area, which will not allow the YPG presence. However, the idea has not received a public support from Washington so far. “That’s funny, because no agreement has been reached,” US Department of State spokesperson Heather Nauert told reporters on March 20 commenting on the statement by the Turkish presidential spokesman that the sides have already reached an agreement over the city. The changes in the Turkish stance towards Russia can be clearly observed through its foreign policy rhetoric. On March 16, the country’s foreign ministry issued an official statement describing the 2014 referendum in Crimea illegitimate. On the other hand, Ankara seeks to maintain at least neutral relations with Moscow and to develop further the economic cooperation with it. The TurkStream pipeline is a strategically important project for the Turkish leadership because it will allow it to gain control over the transit of natural gas into southern Europe. In the coming months, Turkey will continue strengthening its political and military influence in the region as well as developing its foreign policy activity. If Ankara succeed in this, the other regional powers will face additional risks caused by the traditional pan-Turkish expansionism, which arises every time Turkey strengthens its military and political power. to expand its cultural and political influence into the Turkic states of Central Asia and to restore its clandestine influence on the Turkic regions of Russia.